Nominated for Blogs By Latina's 2011 Best News / Politics Blog! Have you ever wanted to strangle the next person who says, "Think positive, because positive energy will beget more positive energy" with the quartz that's daintily dangling on a necklace around their neck? I would dig my hands deep into my skinny jeans pockets and grudingly grumble, "I keep thinking positive thoughts and doing good deeds. Somehow the negative energy of the universe is crushin' mad on me and won't let me go!!! Was I Marie-Antoinette in a past life?" Well, finally. FINALLY! I'm seeing some glimmers of light. What a whirlwind 7 days! I was named CNN en Español's "Notimujer de la Semana" or Woman of the Week by their show--Notimujer--devoted to women's issues. The next day I got news that New Latina selected me to be in their "Spotlight" feature which is dedicated to trail-blazing women. Maybe the cream rises to the top. Maybe all that hard work is finally paying off. Maybe nice gals don't finish last. "YOUR BLOG HAS BEEN NOMINATED!" 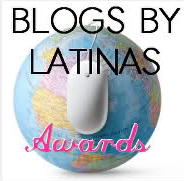 ...by Blogs by Latinas as "2011 Best News/Politics Blog"! Blogs by Latinas is an online directory of Latinas blogging from around the world. Started in 2008 by Monique Frausto, more than 1600 bloggers are listed. Click on Blogs by Latinas to learn more. I started TWLC because I was exhausted of complaining, tired of being frustrated whenever I turned on the news, watched a commercial, or went to the movies, and didn't see anyone who looked like me. Nada. Invisible. Unless, of course, it was time to show the maid or the sexpot. Where are all the incredible, varied, complex, accomplished, ambitious, fierce women I know? Blogcasting the stories of Latinas from all walks of life who are working to improve our families, our communities, our country, our world, and are expressing our opinions on a wide range of topics, is why I started this blog. Our stories must be heard because we are an integral part of this country. My nomination is possible because of them. To vote for the Wise Latina Club Blogs By Latinas' 2011 Best News & Politics Blog--category #12--click here. Thank you for your support. I'm deeply humbled. All this abundance wouldn't be enveloping me, without you. Then simply scroll back up and you'll see a blue button that says "finished"